The 9,000-character (Chinese), 6-chapter long White Paper is the first also to solely discuss China's military strategy. It reiterates China's territorial claims and its tough and assertive tone reflects a confident and self-assured China. The issues of Tibet and the Dalai Lama, which in the past two years have been raised by Chinese interlocutors at every meeting with Indian counterparts, received specific mention in the White Paper after an interregnum of over five years, thereby confirming their current elevated importance to the leaders of the Chinese Communist Party, CCP. The White Paper issued in 2013 did not refer at all to the issue of Tibet while the solitary reference in the White Paper of 2010 was considerably more mellow. Concern in the upper echelons of the CCP about attempts by the US and West to dilute Communist ideology and topple the CCP finds mention in the latest White Paper. These suspicions were heightened after 2012 when former Politburo member Bo Xilai was ousted and expelled from the CCP. Reflecting the negative view of China's leaders of the US and West, the 2015 White Paper asserts that 'anti-China forces have never given up their attempt to instigate a colour revolution' in this country.' Consequently, China faces more challenges in terms of national security and social stability. The military aspects of the White Paper of 2015 continued the trend set by the White Papers issued in 2011 and 2013 to formalise the identities of the different services and distinguish between the PLA's ground forces and the PLA Air Force, PLAAF, PLA Navy, PLAN, and the PLA Second Artillery, PLASAF. The White Paper of 2011 had, in fact, for the first time referred to the ground forces as the PLA Army, PLAA, and this practice has been continued in subsequent White Papers. Significant for China's neighbours is Beijing's continuing concern about its periphery. While acknowledging that the international environment is generally peaceful, it dwells on the likelihood of 'immediate' and 'potential threats of local wars' and notes that 'small-scale wars, conflicts and crises' continue to recur in some regions. 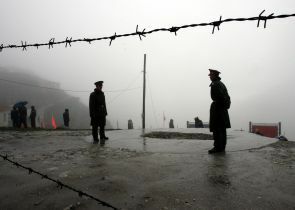 Asserting that 'certain disputes over land territory are still smouldering,' it listed complex and volatile hotspot issues, such as ethnic, religious, border and territorial disputes as among the other threats that China faces in addition to the increased terrorist activities. In an apparent hint that India is also perceived as a long term threat, it identified the 'international competition for the redistribution of power, rights and interests' as a new threat confronting China. The importance of integrated joint operations (IJO) was underscored. The strategic strike force, or PLASAF, it said, will continue to have nuclear and conventional missiles in its inventory and accelerate development of independent innovations in weaponry and equipment. It was tasked to improve the force structure by combining nuclear and conventional capabilities and strengthen capabilities for strategic deterrence and nuclear counterattack, and medium- and long-range precision strikes. Listing the strategic tasks for China's armed forces, the White Paper listed the following new additional tasks: Wffectively safeguarding the sovereignty and security of China's territorial land, air and sea; safeguarding China's security and interests in new domains; and safeguarding the security of China's overseas interests. China, it said, must 'develop a modern maritime military force structure commensurate with its national security and development interests, safeguard its national sovereignty and maritime rights and interests, protect the security of strategic SLOCs and overseas interests' so as to provide strategic support for building itself into a maritime power. A US estimate claims that China has plans to increase its Navy to 351 ships by 2020. Just months prior to the 18th Party Congress in May 2012, Beijing had begun to issue new Chinese passports sparking protests internationally. The passports appeared to be a re-statement of China's perceived territorial limits and mirror the extent of the Chinese nation as envisioned in the maps published by Beijing in 1954, and which continue to be taught in China till today. These include Nepal, Bhutan, Burma and in India the state of Sikkim and India's territories in the North-East comprising the former states of Assam, NEFA and Nagaland, as well as the Andaman Islands. The White Paper has been issued against the backdrop of the appreciably and recently visibly upgraded Sino-Pakistan strategic relationship which has impinged on India's sovereignty and territorial integrity and Beijing's continuing intransigence on tackling the issue of the disputed border or intrusion by PLA troops. It confirms that the PLA continues to rapidly build the capability to win local wars. The focus is on acquiring the capability to rapidly move, by land or air, units of well-armed and well-equipped troops from locations across China to the borders. The White Paper additionally states that the PLAA and PLAAF will increase patrolling along the borders and the PLAN will enhance force projection activities in the South China Seas and increase its visibility in the oceans. Pressure on India can be expected to increase. Can Modi and Xi 'reset' Sino-Indian ties?